Are you looking for the most comprehensive resource on Enterprise Resource Planning(ERP) modules? On this page, you will find easy to follow introduction on each of the ERP system modules. Concepts are explained with texts and images together to give more clarity. After completion of this course you will get absolute clarity on all available modules in ERP system and what are the functionalities of each of the module. More specifically you learn following things. What is an ERP module? List of modules in each of the type. Description and details about each of the module. Enterprise Resource Planning solution consists of different functionalities that are needed for the smooth running of a given business. ERP module is a part of the whole system and that provides specific and tightly coupled functionalities related to one area of business processes. Technical modules are tightly coupled with functional modules and also facilitate smooth integration with different functional modules and application suite. Examples of these are security module and information system management. Learn details about technical modules of the enterprise solution. The collection of inter-company systems and the underlying intra-company ERP system is called an application suite. As more companies start using ERP systems, the next step is to connect these systems so they could support inter-company processes, processes that take place between and among companies. 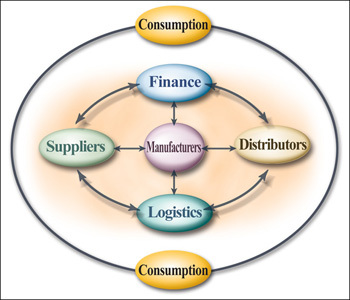 Few of the popular inter-company systems are supply chain management (SCM) and supplier relationship management (SRM) system. Companies can have additional intra-company systems that are an extension of the fulfillment process of ERP systems. Examples of intra-company systems are customer relationship management (CRM) and product lifecycle management (PLM). Learn more about details of application suite for enterprise solution. It records transactions in the general ledger accounts. This module generates financial statements for external reporting purposes. It facilitates employee recruiting, hiring, and training. This module also includes payroll and benefits. It maintains production information. Here production is planned and scheduled, and actual production activities are recorded. Purchase module streamlines procurement of required raw materials. It automates the processes of identifying potential suppliers, negotiating price, awarding purchaseorder to the supplier, and billing processes. Purchase module is tightly integrated with the inventory control and production planning modules. Purchasing module is often integrated with supply chain management software. It manages the acquisition of raw materials from suppliers (purchasing) and the subsequent handling of raw materials inventory, from storage to work-in-progress goods to shipping of finished goods to the customer. It records sales orders and scheduled deliveries. Information about the customer (pricing, address and shipping instructions, billing details, and so on) is maintained and accessed from this module. With the business landscape constantly changing, it’s imperative to keep an eye on the developments in ERP space and new modules and sub modules. If you’ve overlooked the importance of ERP in the past, remember this, 80% of the big and medium businesses in the world run with Enterprise Resource Planning solutions. Even if you only use or learned about one of these core erp modules, it is certain that it’ll help you take another step towards reaching your business and career goals. Do you have experience with any of these business ERP modules? Would you add any others to the list? Share your comments below. Definition of BUILDNET OPT module.